2.4.2 The Eye at Last? Help a Dwemer researcher recover her notes on a Dwemer artifact. Defeat the treasure hunters barring the way. Defeat Quintus Verres and take Tharayya's notes. Pull the levers in Guardian's Helm. Pull the levers in Guardian's Skull. Defeat the Dwarven Centurions in Guardian's Orbit. Find Tharayya crouched next to a tent in Volenfell. Talking to her reveals there is a pack of raiders up ahead. They slaughtered almost all of her camp "this morning." You offer to clear a path through them. You need to defeat all the treasure hunter enemies near the camp. Tharayya runs up to you after they have been defeated, instead of waiting by the tent as she promised. You two trade introductions, and she mentions that her ex-husband probably set up the ambush. They were working on competing studies of the Dwemer, and she found the Dwemer ruin, Volenfell, before he did. He poisoned her and stole her journals, but she survived and went after him with a small army. However, she didn't expect him to have one too. She wants to get her research back from him. She knows Volenfell houses the Guardian's Eye, an artifact she's been hunting for months. She promises to make it worth your while. When you agree, she says her husband, Quintus Verres, must be nearby. You can ask her for more information about the Eye. It is a powerful ancient Dwemer artifact that "someone out there," such as the Mages Guild or her husband, will pay a small fortune for. Next, kill the Imperial Overseer and more treasure hunters before Quintus jumps down. Defeat all the enemies in the area, then give Tharayya's notes to her. She tells you about the ruin. You need to go to Guardian's Helm, a hall accessible through a side passageway, and pull a lever to access more of the ruin. She cautions you to stay alert for Dwemer traps and automatons. She and her crew are going to try to "muscle through this door," and if you Persuade her she will say, "We'll be waiting. I mean working. Here. To get the door open." Unfortunately, there is no way for you to convince her or her crew to help you through the ruin. You will have to do most of the work yourself. Inside, you face Boilbite and other assassin beetles. Continue past them, and pull the levers. Talk to Tharayya. Next, you need to work your way through Guardian's Skull, which contains another lever. Her research implies you will be facing "steam" of some kind. She continues to act suspiciously, claiming her workers are collecting Dwemer items "to, uh…sell them." You can ask her about what she does for a living, where she mentions she got married last week, "divorce and Dwemer ruins this week." She hopes both will lead to immense wealth. Continue exploring the ruins, and you come across Tremorscale. More exploration leads to the Unstable Construct and Dwarven spiders. Pull the lever for the shut-off valve behind the construct, then the release lever. Talk to Tharayya again. The Eye is in the Guardian's Orbit, where the most powerful constructs protect its treasure. "I can't believe the Eye is nearly in my—I mean our—grasp!" In the final room, you find the Eye floating above a pedestal and three Dwarven centurions: red, the Guardian's Strength; blue, the Guardian's Spark; and yellow, the Guardian's Soul. They awaken and attack you when you get close. Each has its own special attack. The Guardian's Strength, red, spins around dealing damage around it as it follows players. The Guardian's Spark, blue, stands in one place and fires its attacks into the air. After you defeat them, Tharayya runs in. She tries to release the Eye, but everyone is thrown back. When you get up, the Eye has disappeared, and undead swarm the Orbit. You need to follow Tharayya south out of the ruin quickly and not try to fight the enemies. Use the tunnel door to the southwest to leave. Talk to Tharayya outside. "The Eye was within my grasp. Months of planning wiped out in seconds. How could this happen?" "I had it in my hands…and it vanished in that blinding light!…Then those undead came, crawling from the ground. Perhaps the Eye woke them." She gives you a reward, and you can continue to talk to her after receiving it. She will warn the surrounding areas since "unearthing the undead is always an ill omen." 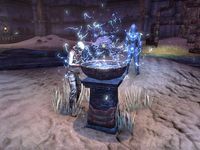 If you speak to Tharayya in Depths of Malatar or Frostvault after completing the quest, she will recognize you, and you will tell you that the mystery of the Guardian's Eye wasn't solved and that the undead are still in Volenfell. This page was last modified on 13 April 2019, at 20:20.